Yeah you read it right. Microsoft has said that “Linux doesn’t exist”. I wish someone had told me before I started using it exclusively as my desktop OS, dammit I’ve been using a non-existent OS all this time 😉 I think if Microsoft spent less time and money on FUD and more on actually making decent software it would do them a lot more good. These comments were made during the first leg of Hilf’s (pictured left) tour of South East Asia. He says the purpose of the mission is to “be descriptive and intelligent in giving people an understanding of open source and debunk a lot of the mythology around open source”. Now I know that I’m a raving Linux fanatic and probably just as guilty of this propaganda as Microsoft from my perspective but COME ON!!!!! This guys sole job is to badmouth open source software, how many other people are Microsoft employing to do this? I have two things to say on this really. The first is that a lot of what he says does have some truth in it, as all good propaganda should. It’s true that a lot of Linux development is sponsored and driven by large companies like IBM, Sun and Novell. It’s not all people doing this in their bedrooms anymore but the fact remains that the code is available to anyone in the world who wants it for free. The Windows source code is heavily guarded in some vault in Redmond where nobody can get at it. The reason it takes Microsoft 6 years to produce an OS is not because they put so much love and effort into it as they would have you believe. It’s for one simple reason… overheads. They have to spend fortunes to develop something that is constantly evolving in the open source community anyway, due in large part to the work of people in their bedrooms. Sure there are big companies investing in Linux now but none of them own it and they never will. Thats what the GPL is for. Meanwhile Microsoft is castigating them for selling out?!! Isn’t that the pot calling the kettle black? The second point is this, if Microsoft is so unconcerned about Linux why do they spend 90% of their time talking about it these days? Thats not the actions of someone who isn’t worried. 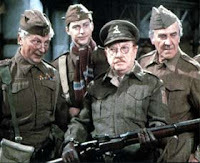 I think we all remember the TV program “Dad’s Army” so I’ll leave you with this. DON’T PANIC MICROSOFT, DON’T PANIC!!!! !